A Nicki Minaj diss track. Last week we published an interview with Remy Ma in which she discussed her philosophy when it comes to diss tracks saying: "That's how I be on it. If you listen to my old mixtapes, if I ever had a problem with any female or anything ever in life, I will say your name." Well, it turns out she's saying Nicki Minaj's name loud and clear in her newest track "ShETHER." The new 6-minute track sees Ma taking direct shots at Nicki and the people in her life. 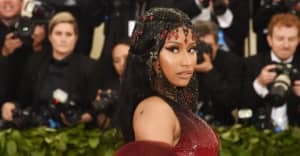 Representatives for Remy Ma and Nicki Minaj did not immediately return a request for comment. In the meantime, feel free to speculate, and listen to "ShETHER" in full below. Update 2:03 p.m on 2/25/2017: Nicki Minaj seemingly responds to Ma's track with two posts on Instagram. One targeting Ma's joint album with Fat Joe titled Plato O Plomo, and another featuring words from Beyoncé.